In the centre of Uniontown, Pennsylvania there is a row of derelict buildings. The faded sign on one of the crumbling facades reads 'Second Time Around'. Donald Trump's hopes of getting elected for a second time around could be dashed if so-called "rust belt" communities such as Uniontown feel the president has let them down. The mid-term elections will be held in the US next week and while President Trump is not up for re-election, his time in office will have a big impact on how people vote. 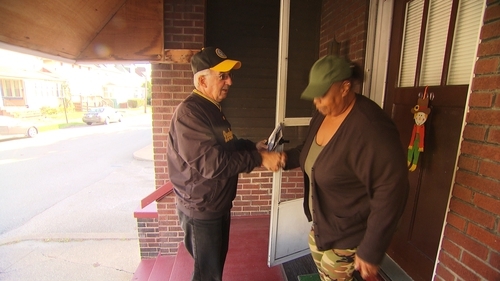 I recently accompanied Democratic canvassers as they went door-to-door in Uniontown. This area was traditionally Democrat, but voted Republican during the presidential election helping Donald Trump get to the White House. Uniontown has been hit hard by the decline of coal mining. When Donald Trump campaigned in Pennsylvania, he promised to bring back mining jobs if elected and on a recent visit to the state he renewed that pledge. He told a rally that he was committed to "unleashing the power of Pennsylvania shale and clean beautiful Pennsylvania coal. Beautiful, beautiful coal". But many here in Uniontown say Donald Trump is failing to deliver on his promises. Randy Connors is a retired coal miner. He told me that a lot of his friends believed Donald Trump's promise to reopen coal mines. "There's no mines opening up. He just lied to them and they sucked it up and voted for him." Asked if his friends regret voting for him, he said some do but others still believe it was the right choice because at least Donald Trump talked about reopening mines. "My friends felt that Democrats completely ignored them. Hillary Clinton said that eventually all coal mines would be gone," he said. Supporters of President Trump say he has delivered on his promises. Bill Kozlovich is the chairman of the local Republican Party Committee and also works in the coal mining industry. "A few mines have reopened. Employment has increased. Support work for the mines has also increased," he said. I asked him if he was concerned about the so-called 'blue wave' of support for the Democrats that is predicted in the upcoming mid-term elections. "I think that instead of a blue wave, there'll be a red tsunami. When you see what happened with the recent Supreme Court hearings, that has converted people and it is going to push them to the polls," he said. Across the street from the Republican Party office in Uniontown is the local Democratic Party headquarters. Tim Mahoney is a candidate for state representative. He lost his seat two years ago, swept aside by an anti-Democrat wave and the rise in support for Donald Trump. "The coal mines aren't opening up and the steel industry has not come back in this area. Trump was a car salesman and he sold his agenda," he said. "I believe that in this area there are a lot of Irish Catholics, like me, and I do not appreciate the leader of the free world degrading other people." On the streets of Uniontown, there were mixed views among voters. A Democratic supporter named James Natale told me a lot of people in the town are complaining about Donald Trump. "They were very enthusiastic about him in 2016 but I don't feel the enthusiasm this time around," he said. Judy Lucas agreed, saying that the people she knows who voted for Donald Trump now regret it. But others had a very different view. Republican voter Shawn McAninch said life in Uniontown had improved under President Trump. Another man named Ray said he would not be voting for the Democrats "because they have gone crazy". He said that President Trump should tone down his rhetoric but added "he's got our backs". There’s a street called Trump Avenue here in Uniontown, Pennsylvania. It is not named after the current president but it does act as a reminder that his presence looms large as voters here prepare to go to the polls next week.